This review, like most, is simply one man's opinion. I've often been asked "what qualifies you to judge a camera?" Well, in my case, I've been behind a camera since the early 1960's, taking photos in some 29 countries. (My photos grace walls from the Ukraine, to Abu Dhabi, to Tasmania. You can check them out, here.) I've been a guest speaker & presenter at photographer's coventions in Germany and across the USA, as well as in my native Canada. 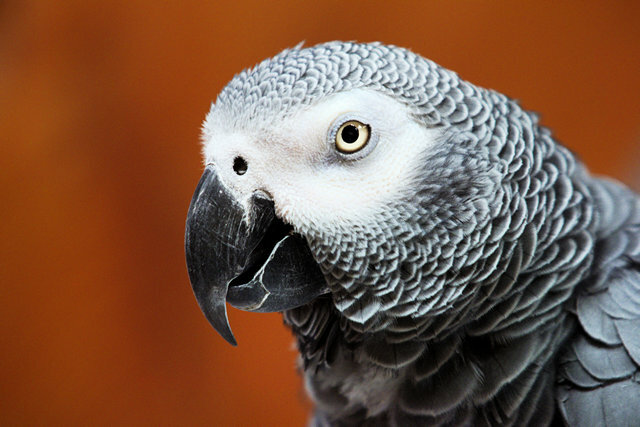 I've taught photography from Rochester, NY to San Francisco and have judged both the "National Nature" and "National Open" competitions for CAPA (the Canadian Assoc. for Photographic Art). I have served on the Board of the International Leica Society, published the popular e-book, "A Brief History of Photography" and, back in 2006, was a pre-production tester-reviewer for Leica's first digital camera, their M8. 'Nuff said. I started out using a Nikkorex 35/2, in 1963. By 1966 I'd graduated to a Nikon F, then the professional's choice for an SLR. Then, in the mid 70's, I had a stint with the Olympus OM-1 - taking it to the USSR in 1975, with great success. After that, and for nearly 30 years, I was a Leica Reflex man, owning a half dozen of 'em - and a couple of their rangefinder models, to boot. I ended up with Leica's R8+DMR combination (click here to download a PDF of my 2006 review) ... the only 35mm camera to shoot film AND digital! I admit that I loved that camera, but when it was destroyed (a long, sad story that you don't want to know) and with the R series discontinued, there was no way to replace it. At the time, the only alternative for my wonderful Leica glass was on a Canon, via a simple adapter. With this combination, I got some superb shots. But, I was never happy with the ergonomics of Canon dSLRs and after less than a year with it, the Olympus E3 came into my world... and I never looked back. Now, as I get older, I find that large, heavy cameras are becoming "a pain in the patoot" (which is, I understand, right between the delicatessen and the safety zone). I wanted something small, light, and easy to carry when I travel. But, as a semi-professional photographer, results still have to be top tier. So, after six and a half years with the E3, I moved to the Olympus E-M1, and just recently, to the E-M1 Mk II. I've had the E-M1 Mk II for about 3 months and I must admit, I love it! It truly is everthing I'd hoped the original E-M1 would be. Well, a host of things. from the obvious, to the not so obvious. 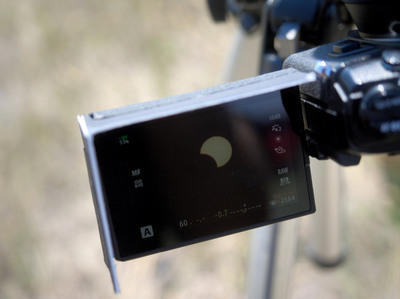 From the 121 cross-point, on-sensor Phase Detection AF, the new, much improved battery indicator, the larger, longer lasting battery, to the simple act of placing the tripod socket under the center of the lens. The computer upon which I am typing this report used to have a dual-CPU (these days, called "dual-core") processor. Recently, I upgaded the CPU to a Quad-core one, and the improvement in speed was quite remarkable. I ran a test program and the time it took dropped from 188 seconds to 73 seconds. The Mark II is seriously over-engineered, and has two (count 'em, 2) Quad-Core processors in it ... one for AF and the other for everything else. It makes this camera seriously fast. Focus, which was remarkably fast in the Mk I, is now lightning fast. And deadly accurate. The mechanical shutter is now almost as quiet as the electronic one. Certainly, it is far quieter than the one in the original E-M1. Really nice, when you don't want to be noticed! In early April of 2017, I was the MC at a "Celebration of Life" for my friend, Tom A., creator of the RapidWinder for Leica rangefinder cameras. There must have been 60 guys there, from Europe to Asia and everywhere in between, all shooting with Leicas ... for decades the "gold standard" for quiet shooting. There wasn't one, of any model, that was anywhere near as quiet as my Mk II! And I was using the mechanical shutter! With the electronic shutter, it's, well, virtually silent. Other things I like in the Mark II, are the somewhat larger "mode" dial and the larger grip, which makes handling the 50~200/2.8-3.5 SWD Four Thirds lens a treat. It was always just a "titch" front-heavy with the Mk 1. Another small point that's often overlooked, by reviewers, is the focus stacking. Not many people use is, but I do. And they should! In the Mark I, the camera would take a stack of up to 8 shots, in RAW - and you could merge them yourself, with other software, or you could shoot in Jpeg and the camera would blend the images for you. But, it was one or the other. The MK II solves this, shooting a series of up to 8 shots in RAW (which are kept, in case you wanted to blend them, later) and also makes a series of Large Fine quality jpegs, in just moments, and then blends them. Once agin, with the Mk I you could watch the shots being taken, at what seemed like two per second. With the Mk II, it's all over in a blink of an eye. Other tiny improvements are that the tripod socket is now under the optical axis of the lens, whereas the Mk I was somewhat off center. For most things, that did not make a great difference, but making critical panorama shots, it made things a wee bit more difficult. Problem solved, with the Mk II ! More importantly, I've used the flip-down screen for serrupticious street shotting, on subway cars, etc. You can flip-down the screen, hold the camera in your lap and never be noticed. Especially if you're using the electronic shutter. If you have to bring the screen out to the side, you suddenly become very noticeable. UPDATE! In August of 2017, we journeyed from western Canada to Orin Junction, Wyoming (pop. 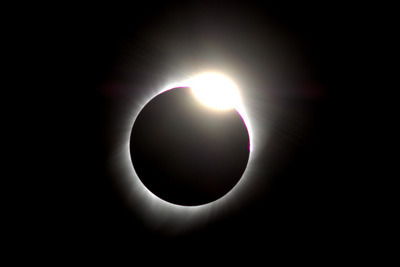 46) ... where we watched (and photographed) the Total Solar Eclipse, with some 8,000 of our closest friends! I added a small shield made from black mat-board and taped it to the finder with "Gaffer's Tape", so the sceen was easier to see in bright sunlght. Being able to angle the screen made life much easier with the lens pointed almost fully up. Still, I prefer the MK I's flip-down screen for general use. I'd be delighted if Olympus made the camera in two versions - much as Sony does with their A7s and A7r. One would have all the video software, microphones, etc., and the fold out screen for videographers, the other without them and the flip down screen, for still photographers. The EM-1 and EM-1v, perhaps! I'm not asking for the flip down version to be at a lower price (although it would be a wee bit cheaper for Olympus to build and a lower price would be nice); just that it be available. The second bugaboo, for me, is the exposure bracketing. I do a fair amount of documentary work - traipsing around after groups of visiting VIPs. If I want to take a series of, say, three shots, with one +1 stop, another -1 stop and the third at the correct exposure, why do you have to press the button three times? Both cameras require it, even in silent shutter mode! Now, I will give Olympus their due. If the Mark II is set to "motor drive" and bracketing, the new camera will take the three shots and stop. That, in itself is a big improvement over the Mark I. The first E-M1 simply takes many shots at the first bracketing setting and then, when the button is pressed again, takes another series at -1 and when the button is pressed the third time, at +1 (or whaever +/- setting has been chosen). Even with the Mark II's improvement, it is often too cumbersome and time consuming to make both those changes, while running after a group of 20 people. It would be nice if, when bracketing is set, that the camera automatically switched to high-speed shooting and took the three shots with one press of the button. It's a small thing, that only a pro would want ... but since Olympus is telling us they're going after the pro market ... Olympus, are you listening? Pro Capture mode is really nice ... especially for things like horse jumping, where only an experienced pro is going to be able to anticipate that "perfect moment". Your press the shutter release half way and the camera starts buffering a series of 14 images, via the electronic shutter. So, when you see that "magic moment" and press the button the rest of the way, if your reflexes were not quite as fast as you'd hoped, you'll still have a second or so's worth of images before that point, to pick from! Brilliant! I can understand Olympus wanting to restrict it's use in to mFT lenses in order to boost lens sales. Olympus claim that they need to control the aperture to do this, but that claim makes no sense to me. I can see no reason why it should not work with even manual focus / manual aperture lenses. Still, even if they don't want 3rd party lenses to work with it, I still think the older, Four-Thirds lenses should! The way it is, it leaves a bitter taste among those who have supported Olympus for many years. Olympus, are you Listening? The last thing that bugs me is the viewfinder blackout during high speed shooting. At max, it's pretty good. At half speed, it should be better, because the shutter is operating only a fraction of the time. But, it appears that the firmware in the camera is a simple "toggle", and at low speeds the viewfinder blacks out far more than necessary. While not horrid, it does make tracking moving objects a fair harder. This should be easily fixed in a firmware upgrade. Again... Olympus! Are you listening? But these are just about the only things that I can think of that I do not like. And there is a great deal to like in the Mark II. Sensor size. Yes, yes, I know. A larger pixel gathers more light, requires less amplifcation and thus produces less noise. So, if two sensors with the same number of pixels are different sizes, it stands to reason that the larger one will have larger pixels. Today's electronics are improved to the point where I will happily shoot the EM-1 Mark II, at ISO 1600 for commercial work and ISO3200 in a pinch - such as in a fairly dark mine or processing mill. For those pixel peepers who worry about such things, let me put it in perspective. I shoot, professionally, with my EM-1s (both Mk I & Mk II) and charge my clients $1000 per day, plus expenses. My clients love the images I get and hire me, repeatedly. "Nuff said. But, how does it work in the real word? Most of the things above, and much more, have been covered by other reviewers. Other than the things noted above, the two cameras are like peas in a pod, to look at and to handle. The real difference is in how they perform. And in that, they are worlds apart! I've had my Mark II about 3 months now, and have watched many a reviewer wax elequent about how good the tracking focus is in the Mk II, compared to the original. And to test them, they show people on bicycles. BICYCLES! C'mon guys, even the MK I would do a bicycle! I wanted to give the Mark II a real test. And, in my neighbourhood, in winter, that means ice racing. 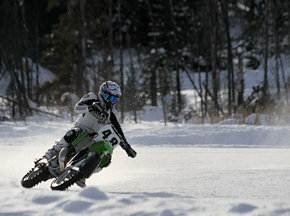 These are the guys and gals who race motocross bikes on frozen lakes, at -20 to -25C (that's -4 to -13F in the USA) at up to 130 kilometers per hour (~80 Mph). I think they're nuts, but they're fun to watch! And a real challenge to photograph. After all, subjects coming almost straight at you are extremely difficult for any camera's AF system of sort out. The other half of this test is the freeze-proofing. Olympus rate it down to -10C (-20C for storage purposes only). I shot days worth of photos, at anywhere from -20 to -25 operating temperatures - one day it was closer to -28C. The battery held up very well, and the camera worked perfectly. Because I had ony one battery at the time (replacements are scarce at the early days, as they were with the original E-M1 and, so far, 3rd party batteries are non-existent) I had to retreat two or three times, over the course of the day, to my car. There I removed the battery and held it up against the warm air vent in the dash, until it warmed up. After that, it would work fine. Two batteries, with one always in an inside pocket, should do it. But the camera, itself, never posed a problem, despite the very cold temperatures. So, what did I find? Well, the tracking has an awful tendency to jump around. It picks it's own target, not the target you want. This is inherited from the Mk I and in my opinion was one of the great downfalls of the Mk I. (To my mind, tracking should pick up whatever the small focus point you've chosen is over and stick with it.) And, when you shoot a series of shots, the tracking can lose track of where it is and will often jump to something else - usually the background. 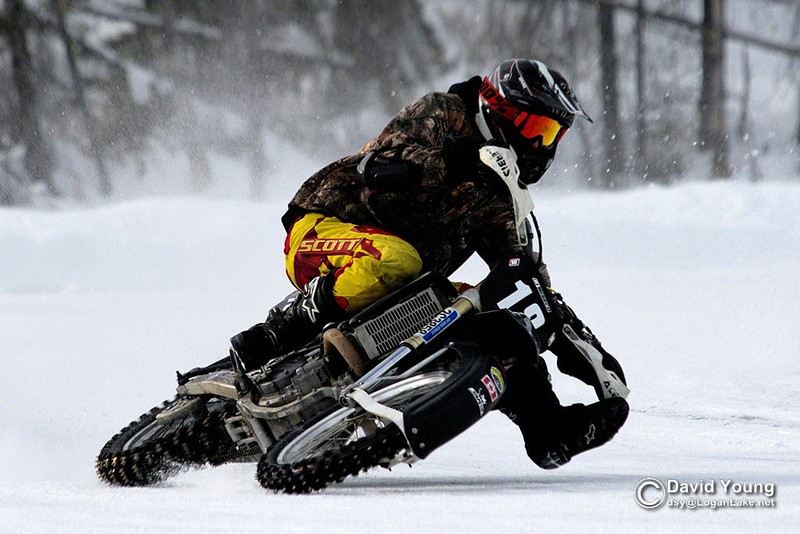 Now, to be fair, the other action events I photograph are Rodeos, though their season is not quite here, yet. I suspect that the tracking might do very well on these quick moving ponies and bulls - sorta like how the camera tracks a bicycle! After all, neither a bike or a bull is as fast as a motocross bike. For the boys on the bikes, the solution was to choose a 3x3 square block, and let the tracking pick what it liked within that limited area, as the smaller area is easy to keep over the bike. Used this way, in single shot tracking mode, it almost never failed, despite the high speed of the bikes. One problem with the 75mm 1.8 Premium series lens was that it's aperture made a quite audible noise. (For more on this, click here.) This problem also affected the 14-42 Zuiko EZ zoom lens. Finally, the original EM-1 solved the problem with firmware update 4.0 with what Olympus called "Smooth Aperture Support". 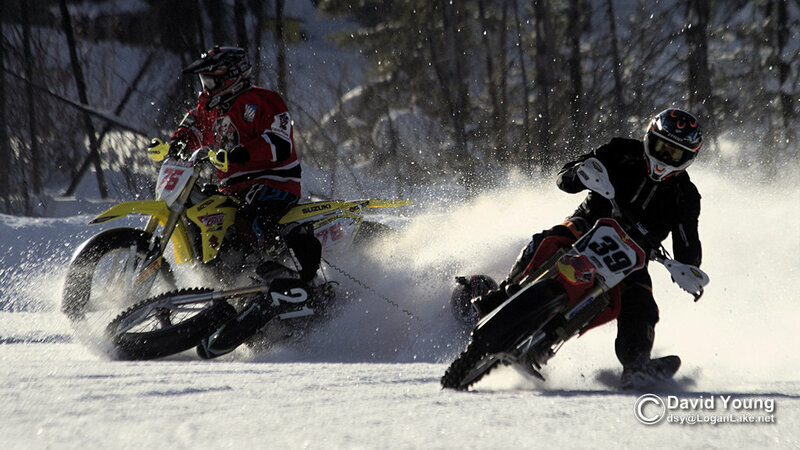 The rider (above) is not losing control - merely keeping his balance, while taking an icy corner at very high speed. Both images were taken less than one second apart, in single-shot mode. You can clearly see the coiled line to the "Kill Switch", which stops the bike's motor if the rider leaves his bike. 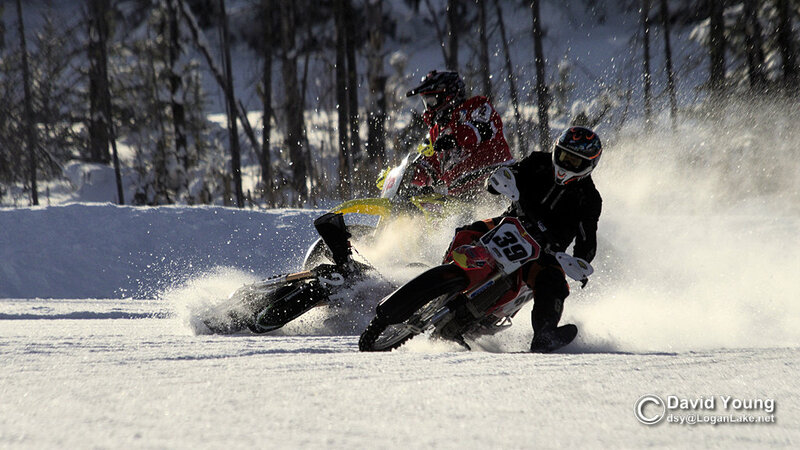 Despite appearances, the #75 & #39 riders stayed upright, while the #21 rider was not hurt. At 80 miles per hour (130kph), the tight formations of the riders can be quite risky. I tried shooting the Ice Racing with a friend's E-M5 and it's almost impossible without the phase detection AF. 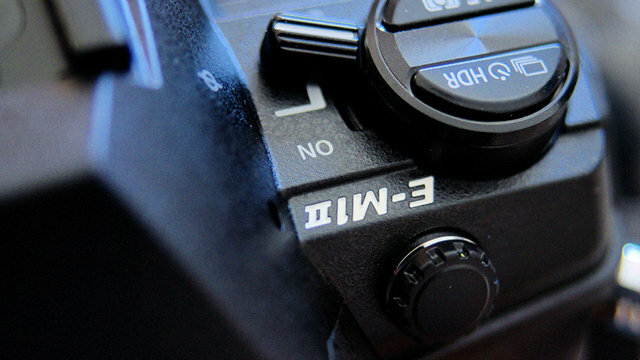 Shooting with the original E-M1 works, but with a high (almost 50%) failure rate. But, when it works, it's great! the E-M1 Mk II almost never fails to caputure the shot! To show you just how well the camera can track fast moving objects, here is a series of 4 shots, taken one at a time, all within 1 second. This was a smaller bike, so likely going no more than 100 kph (62 mph). Each one looks tack sharp in a 12x18" print. Many people have asked me, why I stick with the 50~200 f2.8-3.5 when the 40 to 150/4 is soooooo much nicer? I have to admit, the 40~150/4, is a sweet piece of kit. I've played with my buddie's copy and it's great! Certainly a much nicer "feel", than the 50~200/2.8-3.5 SWD. And I love the lens hood! But there are two good reasons for sticking with the old FT lens. First of all, it's effectively a 400, rather than a 300mm lens. I shoot wildlife and sports; and in both, "reach" is VERY important. With the 1.4x (which was used for all the shots above) it becomes a 560mm vs a 420 efl. Then there's the fact that it's a wee bit faster... up to a full stop, at the short end. But, the most important point is that I already own it and it's matching 1.4x! Cameras come and go ... new technology makes upgrading worthwhile, every second or third generation. But a good lens, if treated reasonably well, will last you a lifetime. My 50~200 SWD is now a decade old, and has been my main lenses for all those years. True, I had to send it in for repair after 9 years, to have it's weather sealing seals re-done (it siezed up, in the rain! ), but it should be good for at least another 6 or 7 years. Some people say that the new lenses are sharper, with better resolution. That may be true. But when the first FT cameras came out, Olympus listed their resolution as exceeding that of a 20mp FT sensor. At the time, my E3 had just 10mp, so even with the losses introduced by the 1.4x there was no noticeable difference! Now, with the 20mp sensor in the EM-1 Mk II, I still see only a tiny bit of degredation when using the 1.4x. True, over time, mFT sensors may improve to 24 or even 30 megapixels, and by then I may have to buy a newer lens. But that is likely another 5 to 8 years away, and by then my 50~200 SWD will be pushing 20 years of hard, professional use. That's what I call "getting my money's worth!" The OM-D E-M1 Mark II (now that's a mouthful!) is solidly built, beautifully finished (almost to the standard of a Leica), lightweight and a thoroughly capable machine. Above all, the images it produces are up to top quality standards, suitable for almost any professional. As I mentioned, earliler, it is everything I'd hoped that the original OM-D would have been. 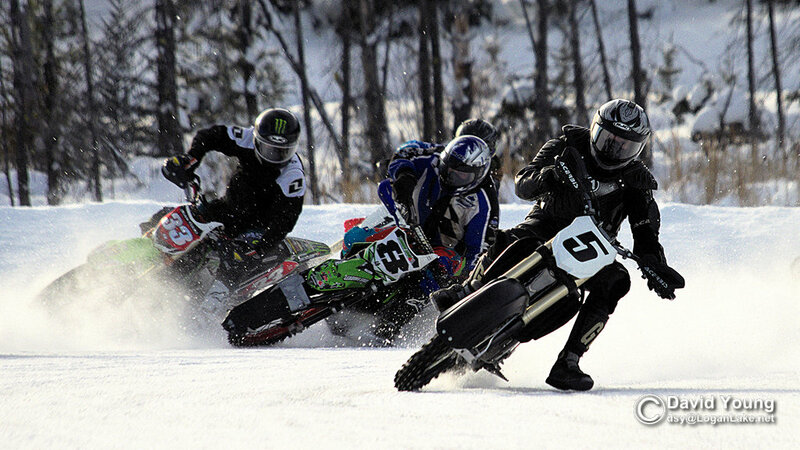 Tracking high speed motorbikes, in freezing weather, it almost never failed. It's not expensive for a top-line camera, but it's not cheap, either. If it fits your budget, it will do almost anything you ask of it. UPDATE: In February of 2018, I sold my beloved 50~200/2.8-3.5 SWD Olympus Zoom, and my 400/6.8 Leitz Telyt, replacing them both with the new Leica 100~400 DG-Vario Elmar. I love it! It works beautifully (albeit with a few quirks) with the Olympus OM-D EM-1 MK II. The full report, if you're curious, is here. If you found this, or any of my reviews, helpful, please consider supporting this effort by purchasing one of my e-books for just US$6.99. 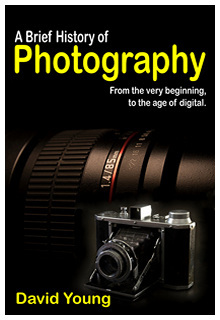 "A Brief History of Photography" is just what it says it is. Fast paced and easy to read, yet it covers the history from 1614 right through to early 2018. It includes not only the chemistry, but the seminal cameras, films, sensors, lenses and accessories of their day; along with their companies and their inventors. It features more than 800 main entries, as well as hundeds more in the, always fascinating, trivia category. It isprofusely illustrated, with over 220 photographs and drawings, and boasts an extensive glossary. More of my reviews can be found here. My other e-books can be found, here. Available as inexpensive e-books for almost any e-reader (other than a Kindle). Or read it on your IOS, Android or Windows computer. If interested, you can also find my antique Debrie Sept and 1950 Beauty Six (one of only two known to exist in the world) at Camer-Wiki.org.